March Madness prospects recap : Who’s hot, who’s not? 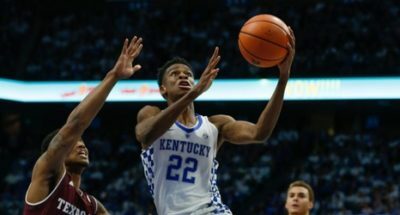 Now that we know who will take part to the Final Four, let’s take a look at how the best prospects have behaved these last weeks. We’ll only take into account players with at least two games played during the Tournament. Nobody expected Kentucky to go far but thanks mainly to Shai, reaching the Sweet 16 is a pretty good result. The do it all guard averaged 20pts 6rbds 6as and 2 stls over the three Tournament games with 25/29 from the FT line. He still has to work on his consistency as he struggled against Kansas State but the lowkey Canadian has the tools to be a top 10 pick. He may not be the best shooting big man projected in the top 10, and even less the best defensive one, yet he brings consistency to the table. In four games, he averaged 20pts 8rbds wih at least 55% FG in every game. Bagley is the safest pick in the top 5 albeit not having the tantalizing upside of Ayton, Bamba or Jackson. The new Ben Wallace. A 6-8 260 athletic oak, Konate was his usual self for a tough WVU team. With 11pts 7+rbds and 2+blks per game, he showed that despite his height, he could be a good rim protector. He still has to work on being a consistent shooter, but his almost 80% FT during the regular season is a good sign. With his defense and effort, he wouldn’t be a bad choice as a late first rounder. Choose your poison! The twin brothers from Nevada are a bit old but have good arguments to offer. Caleb is the sharp shooting swingman who almost stopped Loyola’s cinderella story with 21pts on 5/11 from 3. He struggled more in the previous rounds against Cincy and Texas with respectively 2/7 and 4/12 from 3. Cody is the all around one, albeit a good scorer with almost 19pts per game 6as 5+rbds 1.5blks 1.5stls and 11/12 from the FT line over the three Tournament games. He may have clinched a first round selection with his versatility and defensive prowess. The Wildcats are still dancing and they can thank their trio. Despite average games from Brunson and Bridges against Texas Tech, they’ ve been hot the first three rounds with 19/34 from three for the duo and 4as per game for Brunson. Spellman proved why he could be an interesting late first round pick with 11.5pts 7+rbds 1.6blks and 11/19 from three. The Villanova kids brings skills, toughness and a winning mentality to the table, something a lot of other prospects lack. Willams is not a potential franchise player, but he can be useful for sure. Alongside Tyler Davis, Williams averaged 11pts 11rbds and 2.3bls per game with 15/20 from the field. The Aggie is strong, athletic and will help a weak defensive team cement his inside presence at both inside positions. Duval was his usual consistent self. He was bad against Syracuse with 2pts 4as and 3tos, OK against Rhode Island with 11pts 7as and only 1to, but 3/10 from the field. Yet, his 20pts and 6as against Kansas and 19pts and 8as with 4/5 from three were pretty interesting. Is he better for him to stay and dominate next year while working on his consistency and shooting or leave for the NBA right now and take the risk to do a Mudiay, it’s up to him. He can score, averaging 25pts in the first round and 17pts against Villanova. Yet, he still has to work on his shooting (1/6 from three combined) and cut down on his turnovers (10tos combined). Sexton needs to be a better floor general and for now, he’s nothing more than a scoring PG with average shooting. He was good all year but a bit overrated by a lot of scouts. He hit a wall in this Tournament with awful perfs, 6pts 4rbds in a hard win against #16 Bucknell and a 2pts on 0/4 shooting against Syracuse zone defense. the Spartan will for sure enter the draft as he’s projected in the top 5, but he will have to avoid those mental lapses and become a 48min warrior to succeed in the League. Previous Previous post: Franchise players vs Glue Guys, is the money always worth it? Part 1, like glue.